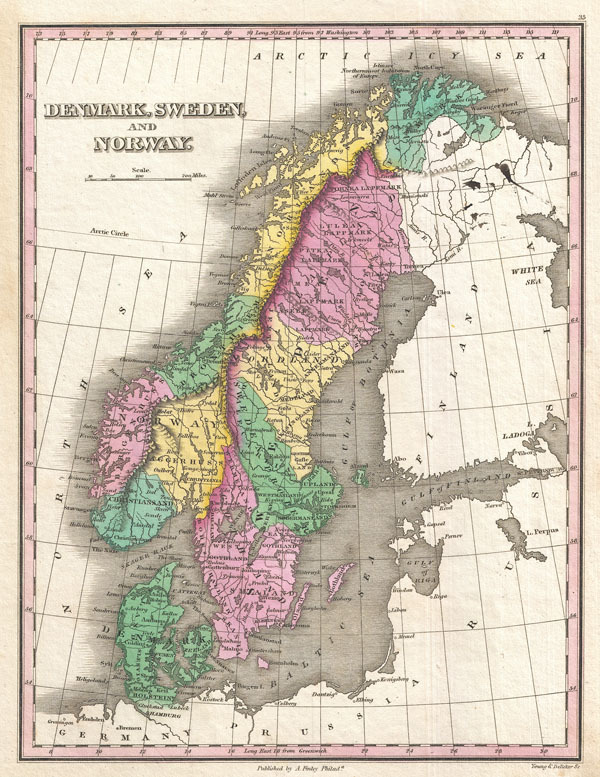 A beautiful example of Finley's important 1827 map of Scandinavia. Covers Norway, Denmark and Sweden. In Finley's classic minimalist style, this map identifies cities, forests, river systems, swamps and canals. Notes the legendary and semi-mythical whirlpool known as the Maelstrom (Mahl Strom) in northwestern Norway. Color coded according to regional political boundaries. Title and scale in upper left quadrant. Engraved by Young and Delleker for the 1827 edition of Anthony Finley's General Atlas. Very good condition. Minor ink mark in upper right quadrant. Original pressmark. Blank on verso. Rumsey 0285.036 (1831 edition). Phillips (Atlases) 4314, 760, 752, 6045.